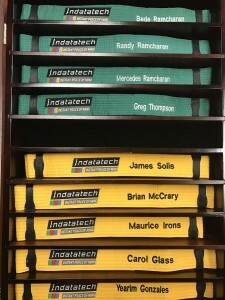 San Antonio, Texas – Indatatech, a global logistics and Supply Management consulting firm, announced today that five employees recently earned their Lean Six Sigma Yellow Belt certifications, and two employees their Green Belt certifications. Yellow Belt certifications: Carol Glass, Bookkeeper; Yearim Gonzales, Data Analyst; Maurice Irons, Project Management Associate; Brian McCrary, Logistics Technician; and James Solis, Client Services Manager. Green Belt certifications: Greg Thompson, Director of Operations and Mercedes Ramcharan, Director of Resource Management. Ramcharan, who holds a Green Belt certification, said this training is just one of several the company has planned to provide their employees this year.